Halloween is getting the 3D printing treatment in our house this year. With machines and materials to test and experiment with, what better way than getting the kids involved and printing some useful and interesting objects for some spooky Halloween fun. I always print out a few new things for Halloween, but this year in particular it seems to be getting more popular to design and 3D print objects for a custom twist on the celebrations. My daughter also needed something a little different for a play. After some discussion we decided that a fascinator headband was just the thing to add to her costume. Looking on the usual 3D model repositories we could not see many at all, headbands and a few hair grips, but nothing that stood out as a useful starting point. It was a perfect fit on the 300mm x 200mm BCN3D Sigma build area. 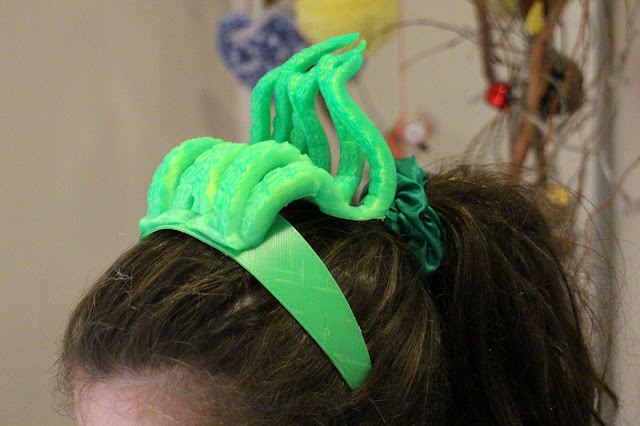 We easily set out the shape of an Alice band in Sketchup, deciding to lay it flat for easy 3D printing, and thermo-form in hot water later after printing. 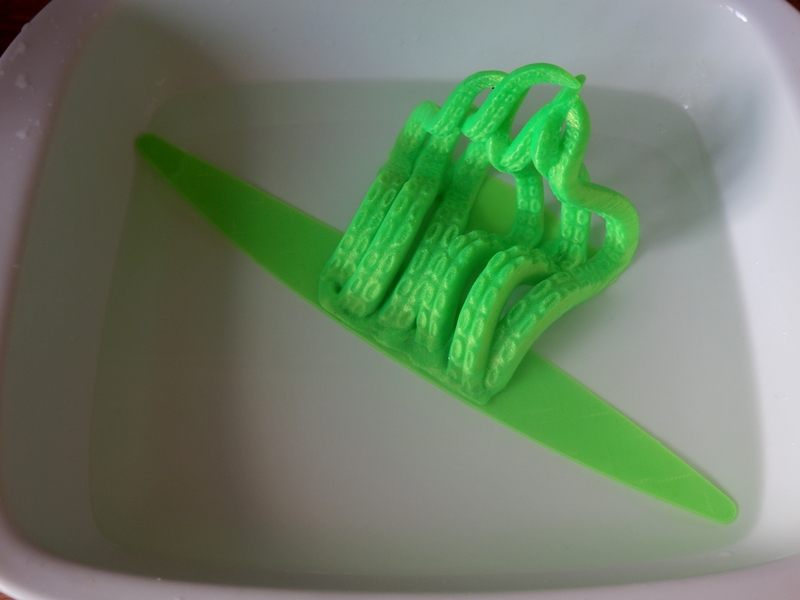 Thermo-forming in hot water is a very easy way to transform flat prints into more elaborate shapes that your 3D printer would find very tricky to make. This was quite a large object, so printing it flat and reforming it with hot water (PLA) or if you print in other plastic's you may need to use a heat-gun. I have published this model up on Youmagine here if you want to use or print it out. 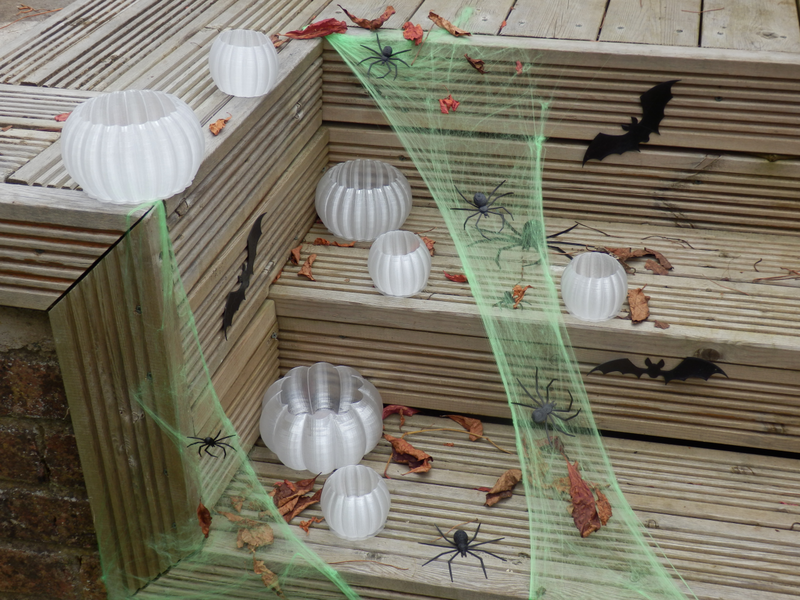 My recent experiments with Refil (Recycled plastic for 3D Printing) resulted in many wonderful translucent PET pumpkins. 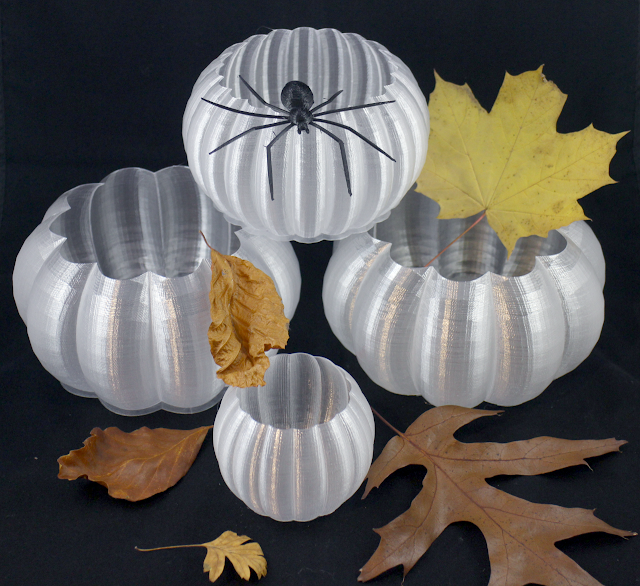 These pumpkins designed by Jeremy Gillick (get them here) are quick to print as a single walled object Add light and they come to life. 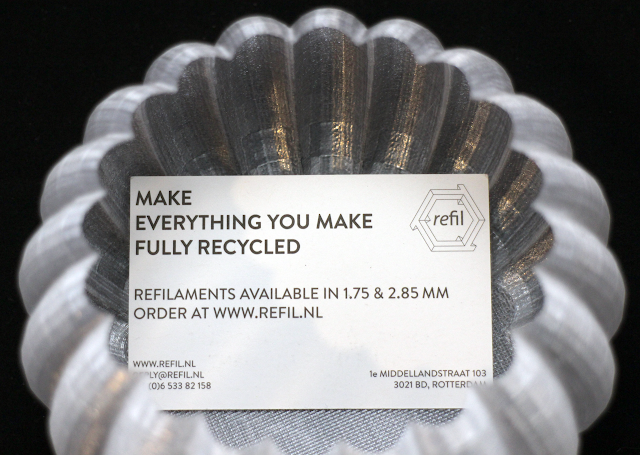 Refil 90% recycled PET material for 3D printing. Flexible printing - it's even more scary! 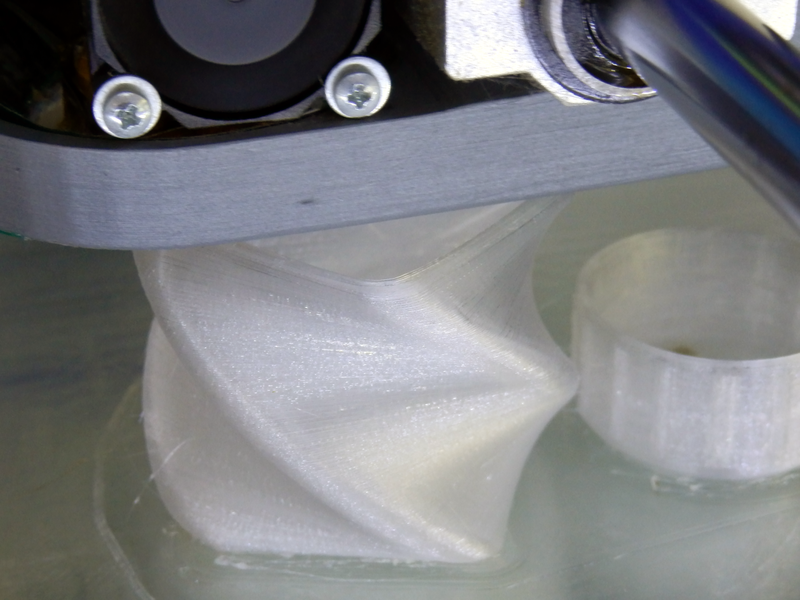 I was also testing out the nice new Hephestos 2 3D Printer from BQ during October (blog post soon) - This machine is the most ideal printer for flexible materials I have ever used. In fact for me it's the perfect dedicated FilaFlex printer. You can use Ninjaflex or Semiflex or almost any other rubber, urethane, elastomer you like. 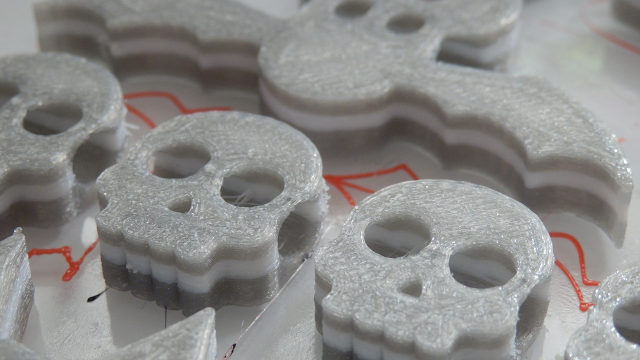 They all print perfectly due to the fantastic fully supported metal extruder design. 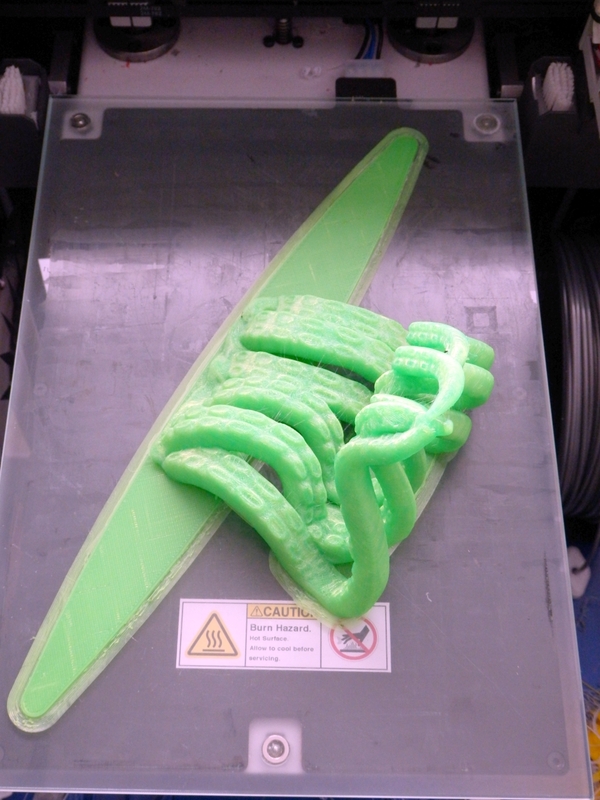 I believe this is the most filament support ever seen in a 1.75mm extruder - Very impressive BQ. This gives fantastic control and almost no ooze even at 50+mm/sec print speeds. Bats, Spiders and Glo-bobs all had the FilaFlex TPE print treatment. 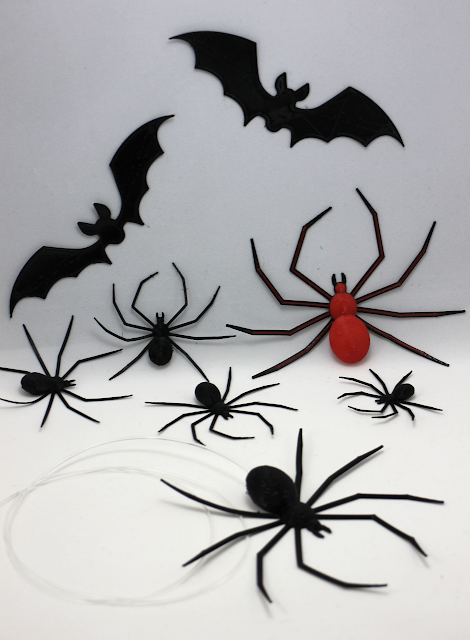 Awesome Halloween Spiders by Scott Lahteine done in OpenSCAD - we really enjoyed printing and using these, in FilaFlex they stick to windows! The 'Flat Bats' are also great printed in FilaFlex, allowing them to be a bit more flappy - Designed by Faberdashery - Go get them here, they are essential Halloween printing. 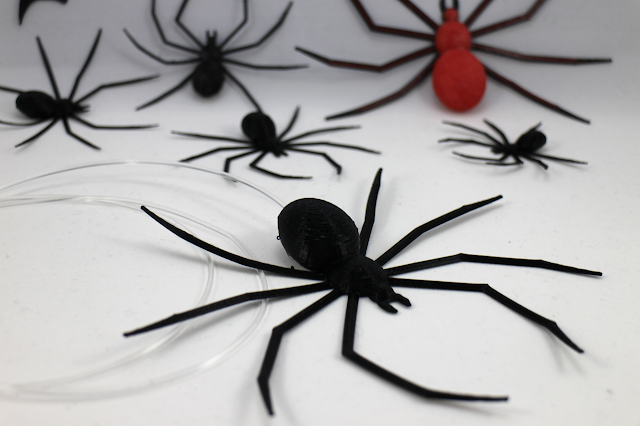 My Daughter had the fantastic idea of adding some clear FilaFlex filament to the spiders, they are now hanging all around the house. 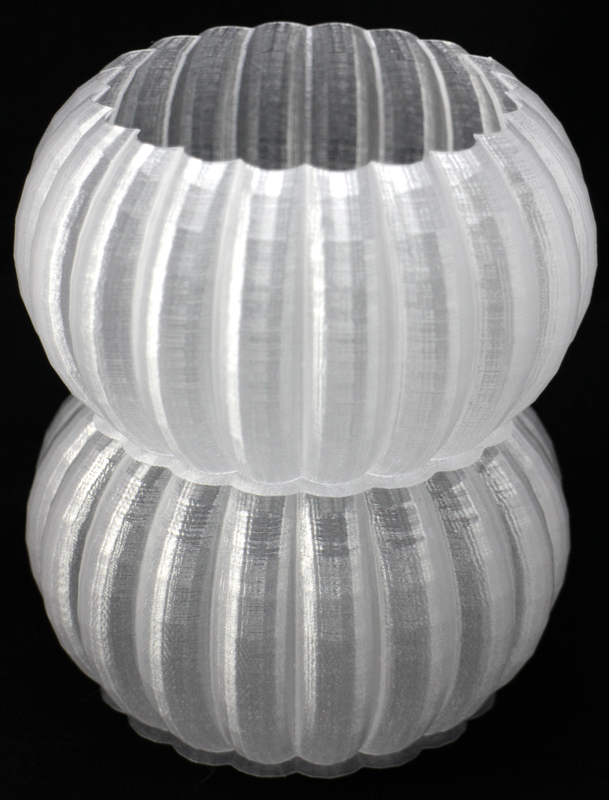 We also printed a lot of Faberdashery Glo-bobs in various FilaFlex colours. These are wonderful little models that are designed to slide onto a bangle glowstick, the eyes glow and kids totally love to wear them. They'll look really good in the candy/fruit bowl. 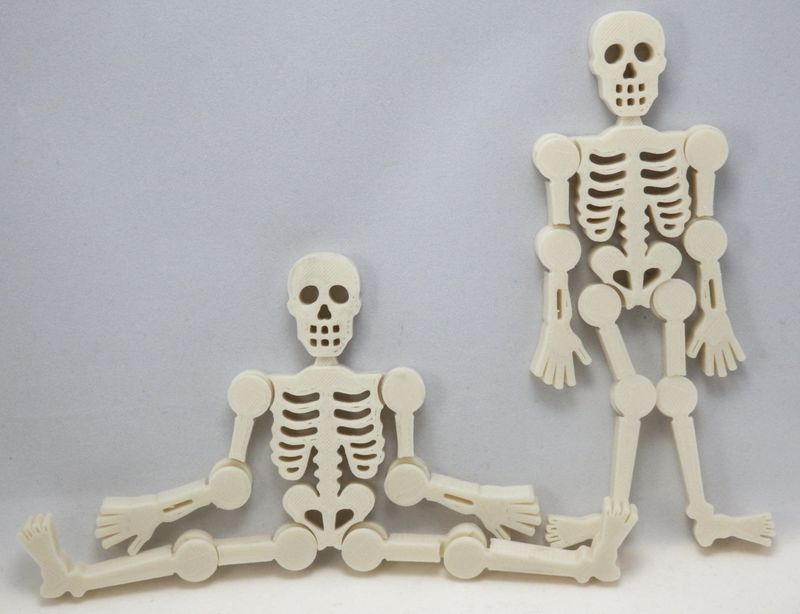 We also printed some of the great movable 'skeletonz' (Files here) by Murray Clark on the BCN3D Sigma - they all printed perfectly in Colorfabb GlowFill (glow-in-the-dark) PLA filament - no supports required. Not quite so scary, but a wonderful design and easy to print, the Great Pumpkin by Perry Engel is another nice 3D model - these were printed in Colorfabb Orange PLA. 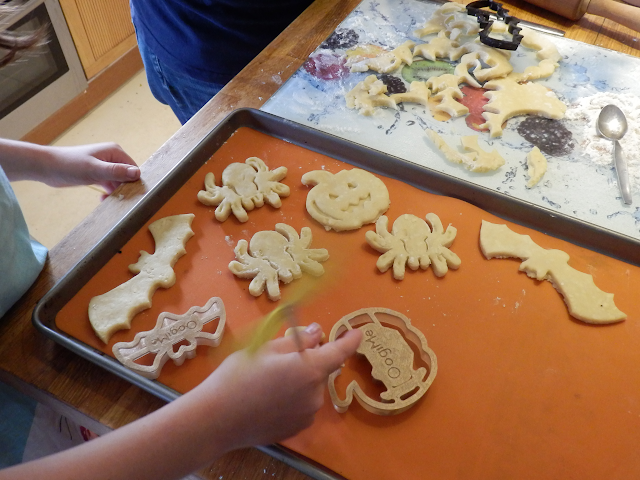 We printed these cookie cutters out last year, they have already been used many times, and still provide a lot of making fun for kids (and Adults). 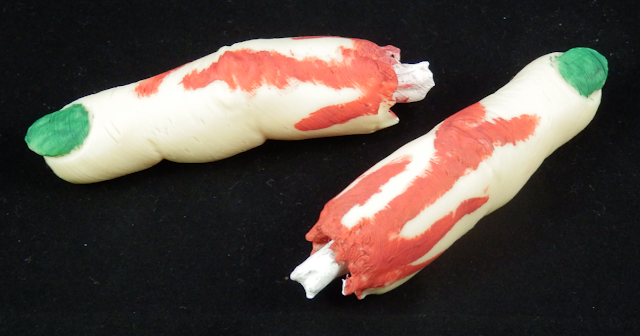 These were designed by Oogime and can be found here. My spider print comes out every year. Printed with Faberdashery Glowbug (glow-in-the-dark) filament and a sprinkle of glitter onto the glass build surface before printing. 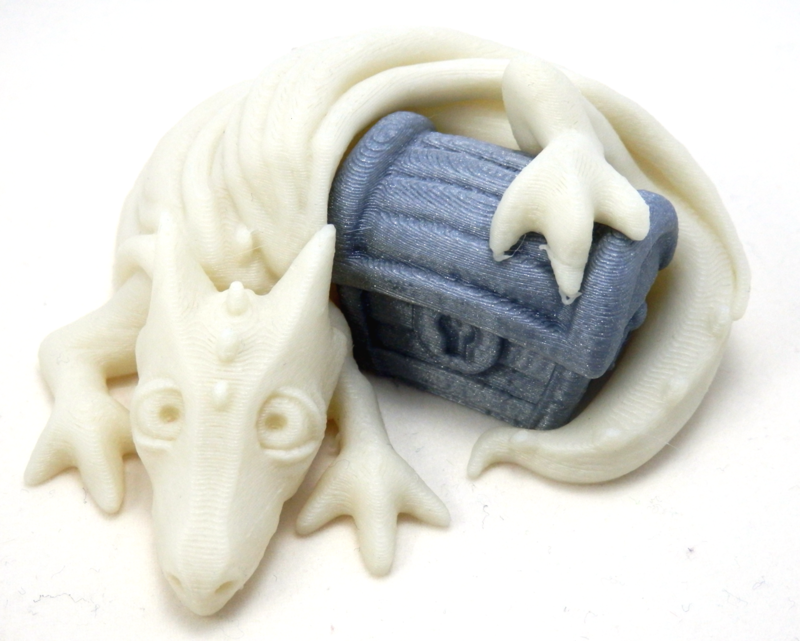 Glow in the Dark Treasure Dragon by Andreas Boelher - Dual extruder printed on BCN3D Sigma. We are having some fun by exploring some extremes of desktop 3D printing. 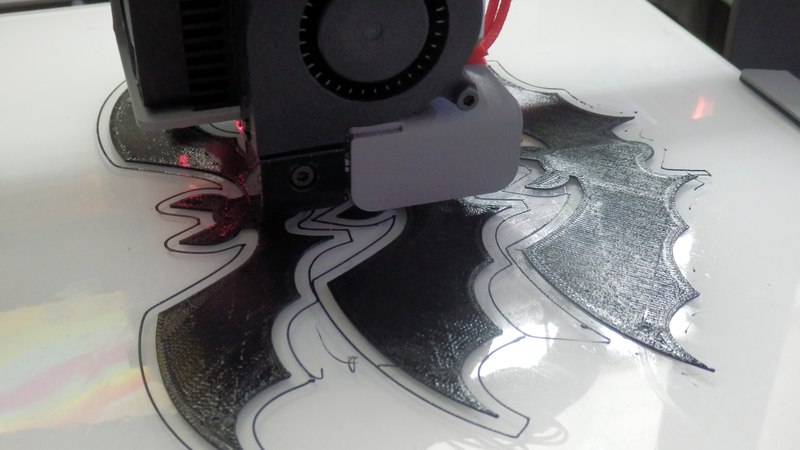 How small, detailed, BIG, coloured or modified can you print a Dragon. The queen of Dragons Louise Driggers @Loubie3D is the ultimate judge of Dragon Master worthiness. You can win lots of cool stuff from E3D and Colorfabb. 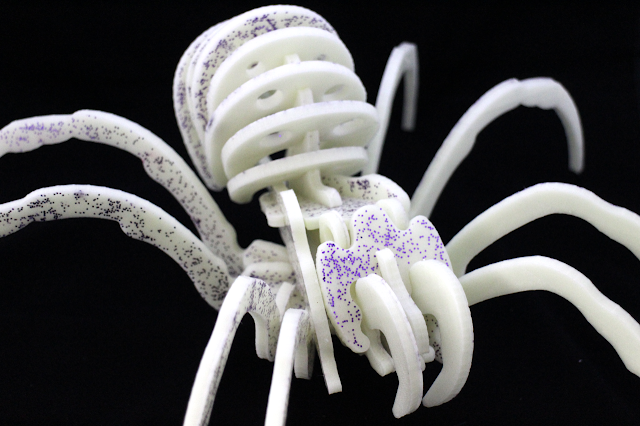 What started as a friendly challenge, has exploded into a worldwide show of 3D printing excellence. Thank you to all who entered or showed support. 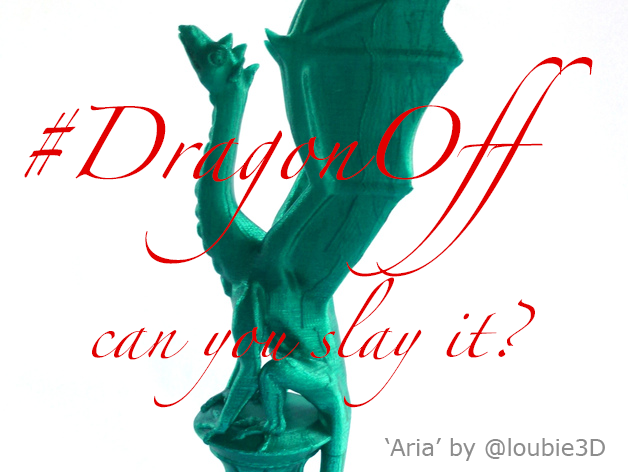 I'll have a dedicated Blog post about DragonOff in November after the winners are announced. 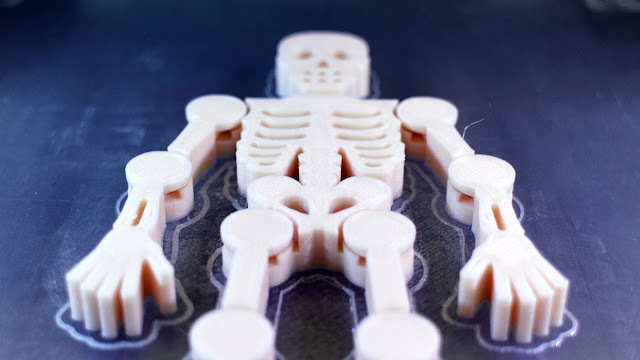 I must also mention the great 10 Halloween makes blog post by Faberdashery, well worth a read, it's what got us all inspired for ghoulish adventures into 3D printing this year. - Thank you Faberdashery! 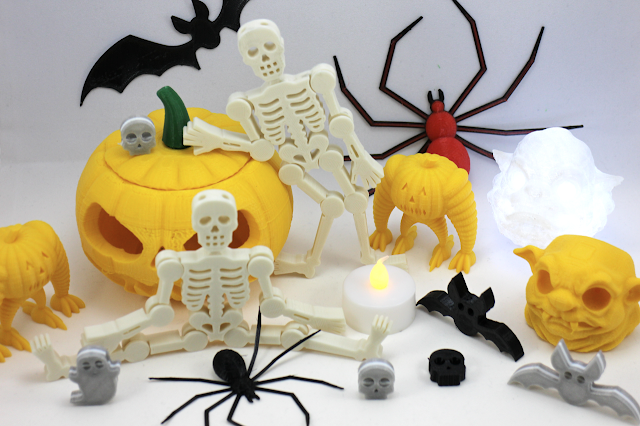 We are all set, you still have time to 3D print Halloween - I hope you find time to have some fun. Thanks for reading, until next time, stay spooky. 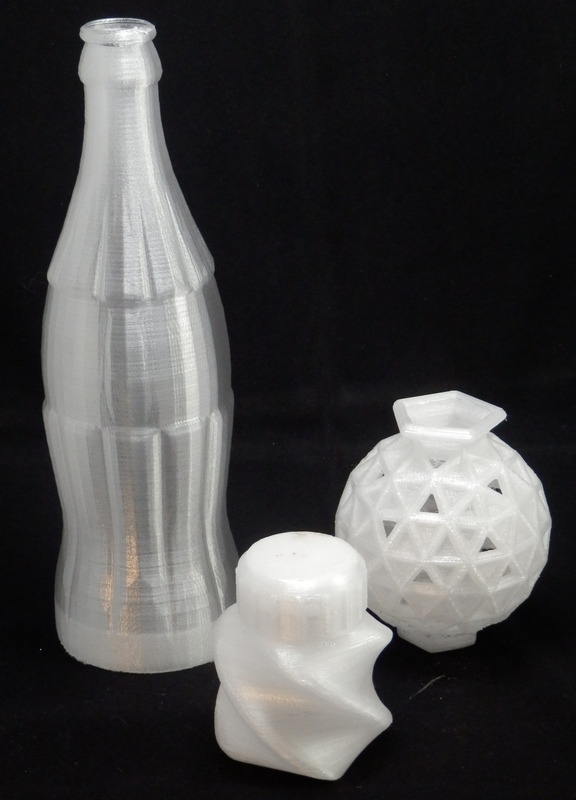 Recycling Plastic for 3D Printing - Why not the default? 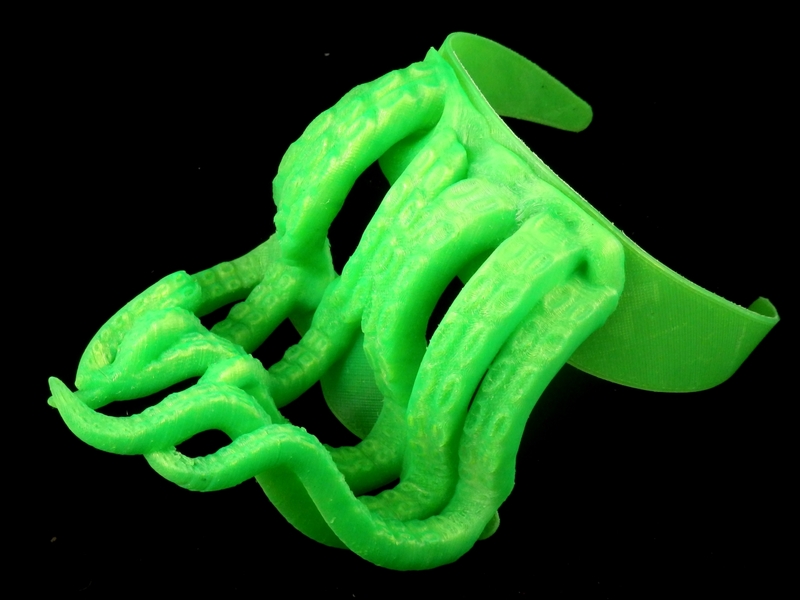 In a subject I'm very keen to promote, this time we are looking at recycling of plastic into filaments for 3D Printing. This won't be the only post on this subject. 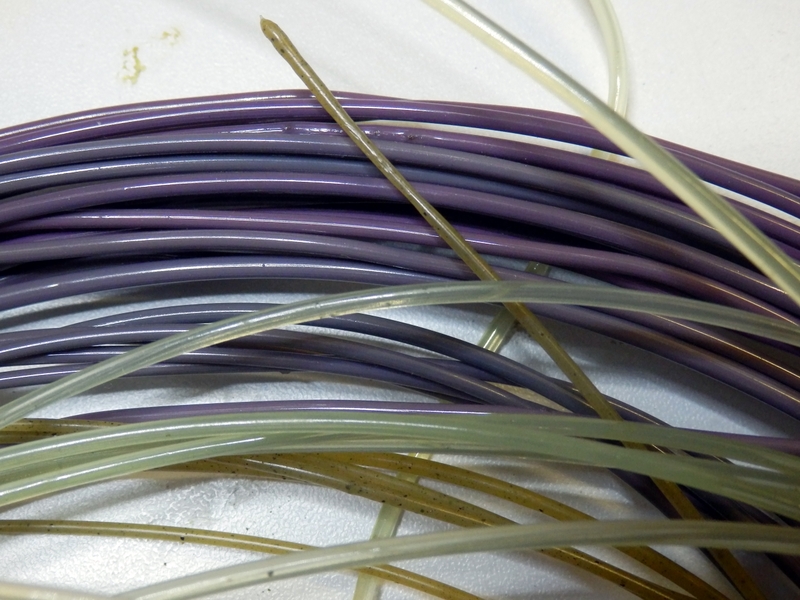 In recent months we have seen a number of companies setting up to address the issue of making recycled plastic filament for 3D printing, I'll do my best to report on how they are doing and what the various finished materials are like to print with. 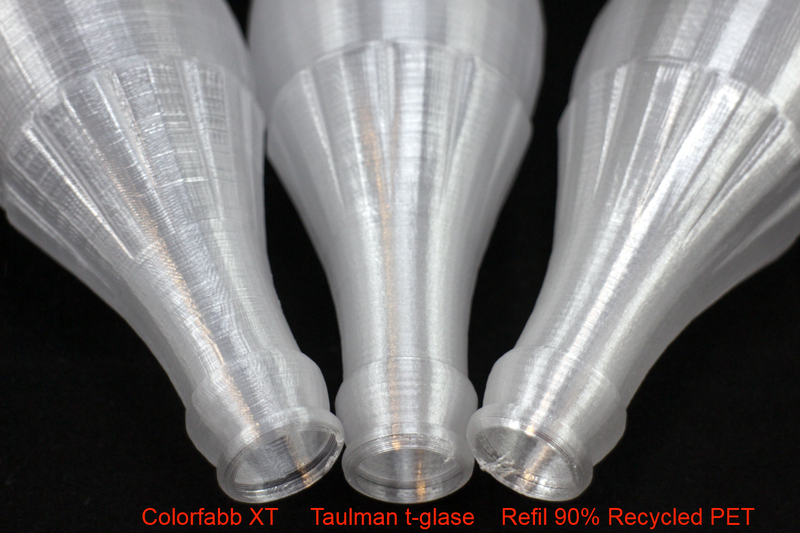 And if you are a new company looking at recycled 3D printing filaments, do get in contact with me. Recycling is not as easy as it sounds, and many companies have tried before, but now further refinement and focus into this area for 3D printing should anyone to start using recycled filament for their 3D printer. And before you dismiss, they are not 'bad', so read on and think about giving it a try. 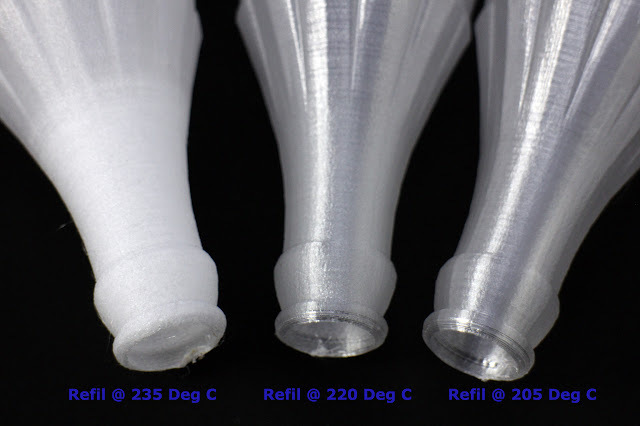 Anyone that has tried to manufacture their own 3D printing filament on a small scale, will understand how tricky it is to get consistent results, even when using new plastic pellets. Last year I was very lucky to be given a desktop filament maker, in need of a lot of repair and attention, and as it turned out a total re-design including a new drive motor and power supply. 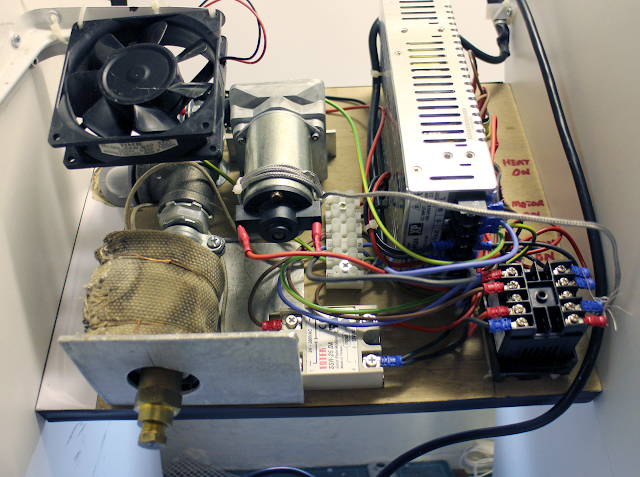 This Filament extruder was kindly was donated to me by 3DFilaprint, it was a great repair project to work on, and one thing it taught me is that making quality filament is a very, very tricky job. I have produced batches of high quality ABS for a local makerspace, and some reasonable PLA. I even tried to recycle some Polypropylene and PET, with limited success. 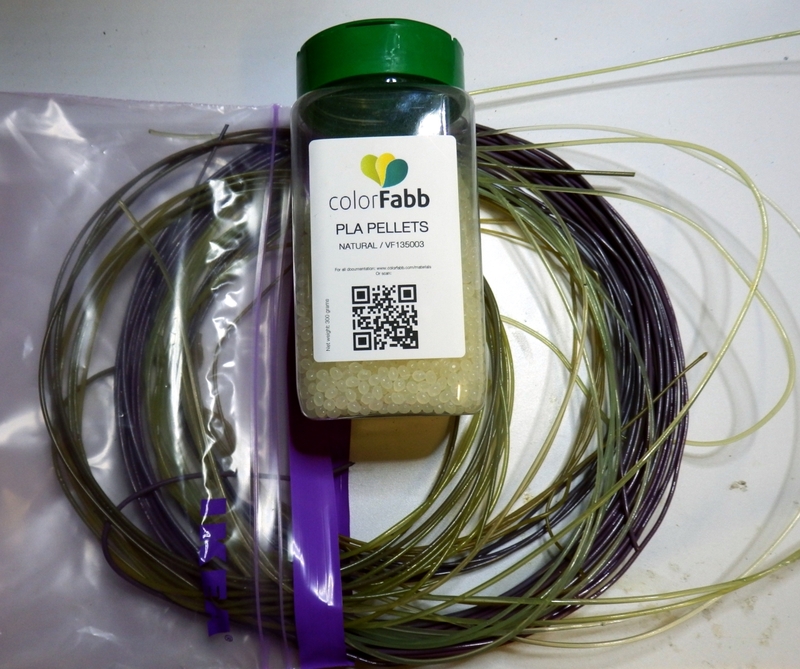 Certainly the most easy method was using ColorFabb PET, PLA and WoodFill Pellets. Making my own custom coloured WoodFill filament was fun, and unique. To take scrap plastic, sort into material type, clean it, process and extrude into accurately dimensioned feed-stock for a desktop 3D printers is not an easy task. 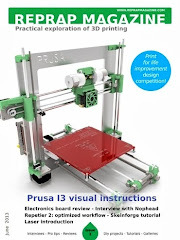 3DHubs recently ran a competition encouraging people to post failed 3D Prints, I sometimes have interesting fails on a 3D printer - usually when testing a new machine, experimental materials or settings. 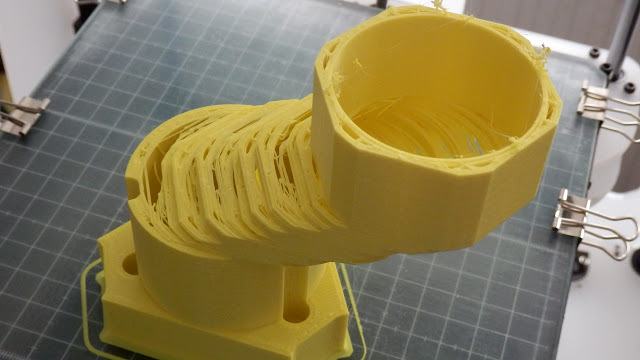 I posted this image above of a failed print - the print failed due to a mechanical issue on the prototype machine being tested - it was not the fault of the filament or plastic extruder system used in the 3D printer. 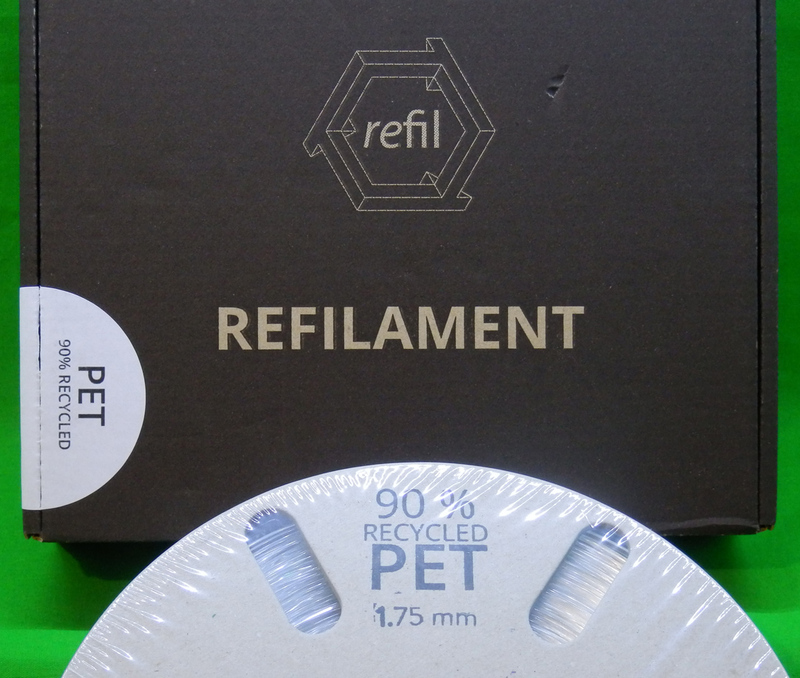 I was rather delighted to win a roll of Refil Re-filament PET plastic. 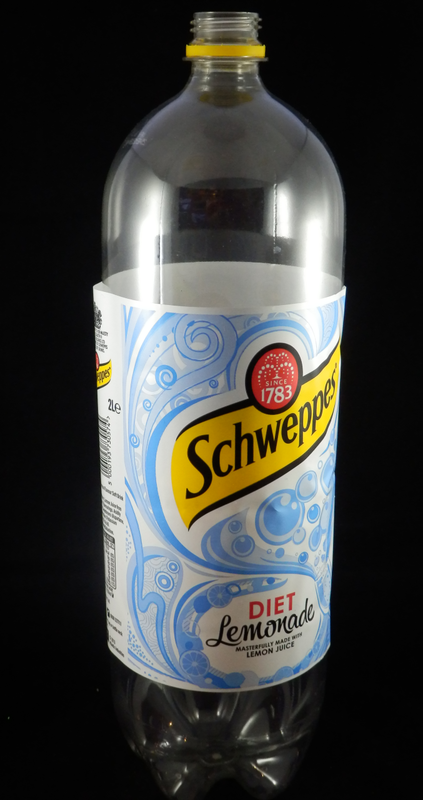 This contains up to 90% recycled plastic drinks bottles. The team at Refil have been working on this problem for the last three years. 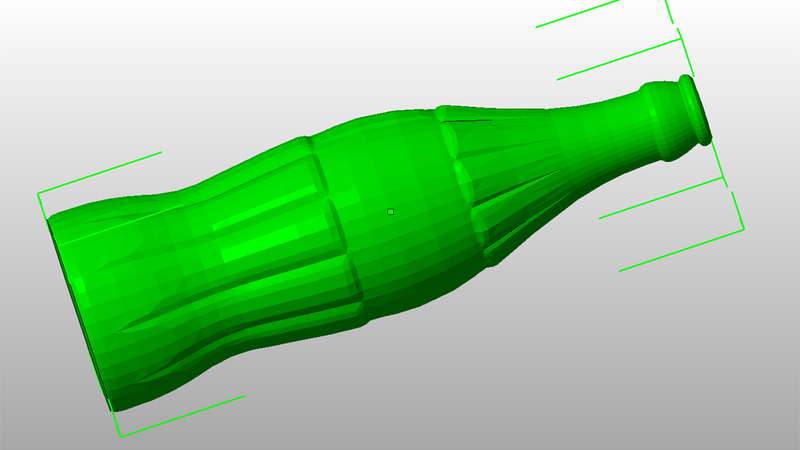 Now the thing with using recycled plastic for 3D printing is not so much about cost, but rather time and success rate. Exactly the same requirements exist for new or recycled material that will be fed into a desktop 3D printer. No allowances can be made just because it's recycled. If brand new or recycled filament causes print jams, inconsistent extrusion or poor quality prints, then it's not going to be a product any 3D printing operator will want to use or recommend. I would not use 'bad' or inconsistent, poorly dimensioned filament even if it was free. The time and effort to produce 3D printed parts is not worth trying to use 'bad' materials with current 3D Printing extruder technologies. Raw new plastic pellets are around ~$3 per Kg - the main reason why people pay 10x the cost or more for this to be produced into a dimensionally controlled filament coil is mostly about good quality. Maybe if we ever have reliable pellet or recycled chip based extruders available for 3D printers, we can be a little more forgiving, but at this moment filament needs to be really good for people to use and get high quality finished results. 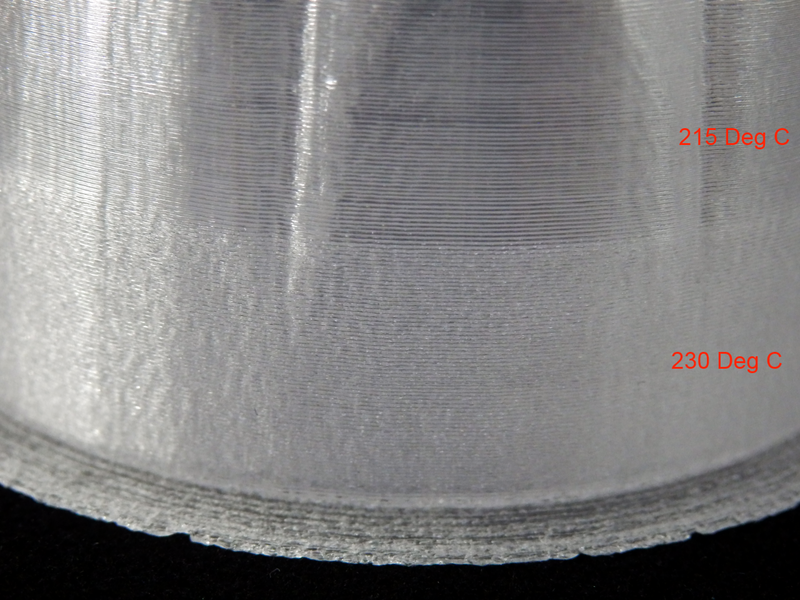 If plastic filament is made to the correct dimensions the 3D printing process should be reliable. There should be no reason why recycled plastic can't be as good as new. 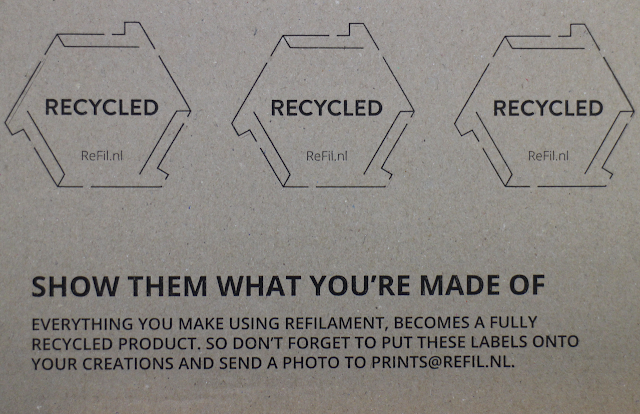 As you would hope and expect, the packaging of Refilament is also recycled. The compressed cardboard spool works well, without any loose cardboard fibres to spoil or clog the delicate heated nozzles used in most desktop 3D printers. 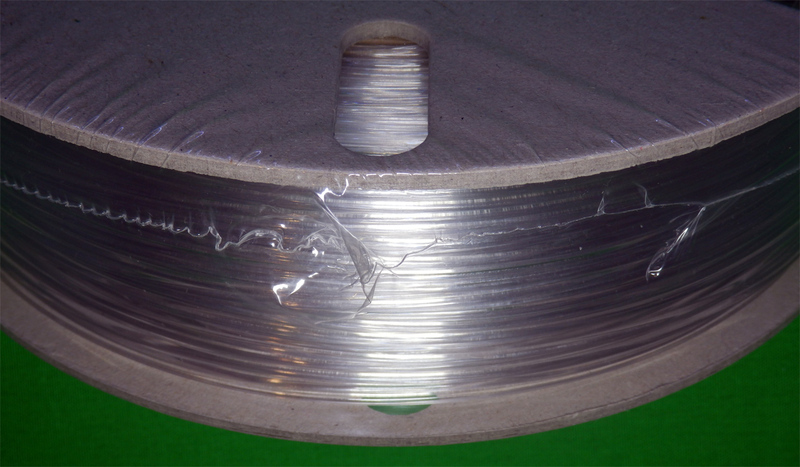 The empty spool is also slightly lighter than an equivalent plastic spool, so you are paying less in transport too. 750 grams of filament, whilst the total weight including packaging is around 900 grams. I had a complete roll of clear PET re-filament and a sample of the black ABS filament that is made from recycles car dashboards. The overall look is something many people can be more flexible with, sometimes you just need the 3D print, so colour and shade, shiny or matt is something that can be allowed to deviate. Ideally it should be as consistent as possible. The clear PET, is indeed very clear. In fact it's so clear and 'new' looking I was even slightly concerned that this was indeed new material and not recycled. 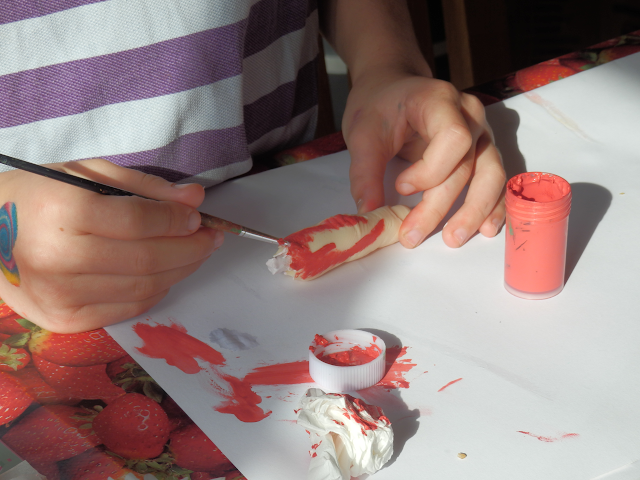 I was expecting some bubbles and maybe even a few slight colour tints or a slightly opaque tone. PET is not a specific description. PET (polyethylene terephthalate) Or 'Polyester' comes in many different types and formulations, PET-T, PET-G, PET-E and PET-P. 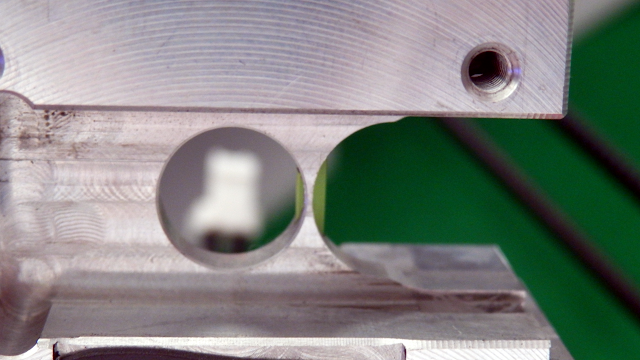 The most important aspect is a good tolerance and accuracy of dimensions. My roll was 1.75mm, and that's more demanding to keep in tolerance than the bigger 2.85mm filaments also used for 3D printing. I measured around 50 points during the roll of filament usage, start, middle and end. The filament feels consistent when you run it through your fingers, that's a good starting point. The entire roll was 1.76mm - Virtually no deviation in size or roundness at all, nothing that would be of any concern for 3D printing. 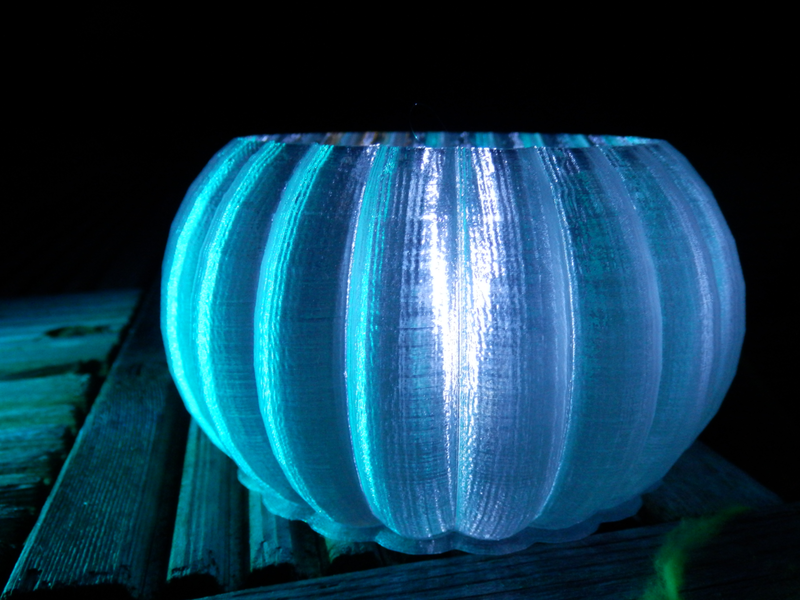 The filament was round (you want to avoid oval shaped filament). 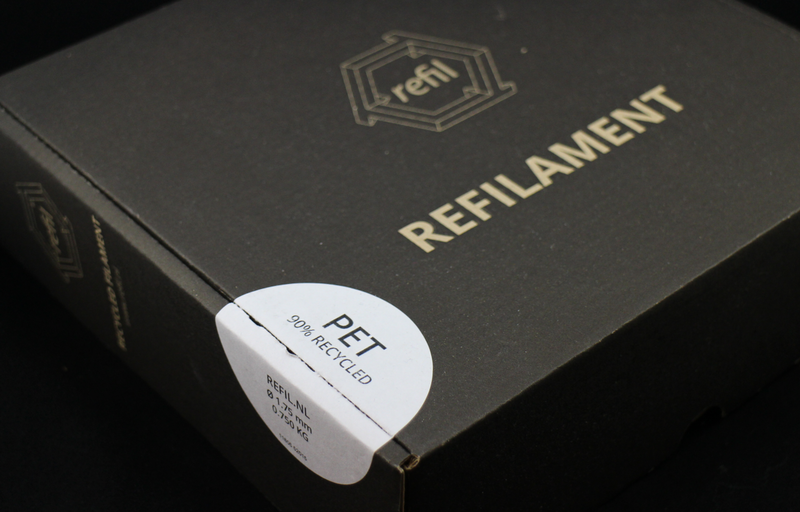 If you didn't know this was recycled PET, you would have no idea from looking at it, using it, or seeing the finished printed parts. It's some of the best tolerances on 3D Printing material I have used. I started at a normal PET temperature of 230 Degrees C and printed out a simple single walled vase for a test of optical clarity. If we look close at the bottom section of the bottle print, you can see where I adjusted the temperature. 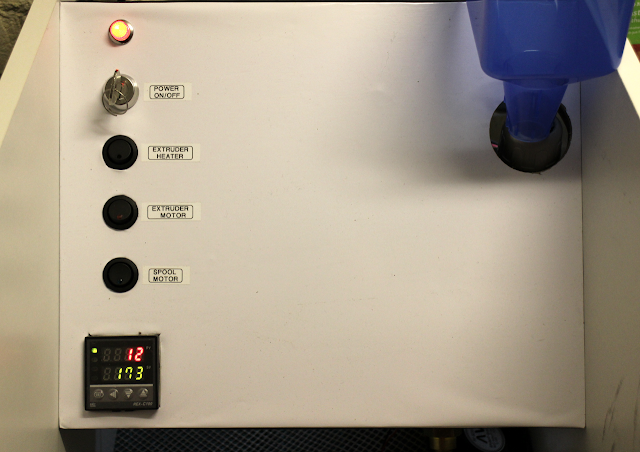 I spotted that we had bubbling in the filament - Lowering to 215 was a good temperature. I later found you can go down as low as 195 Degrees C.
As far as I can tell, the bubbling is not from moisture content. Lowering the print temperature fixed all 'frosting' issues with Refil. 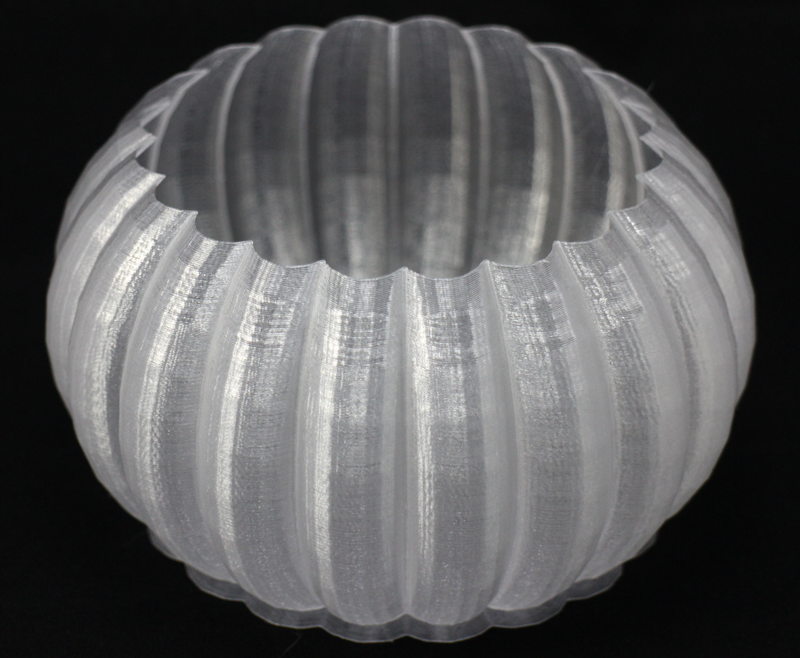 You can't really ever get clear prints, even with clear PET, the 3D Print layering process causes a slightly translucent final print. 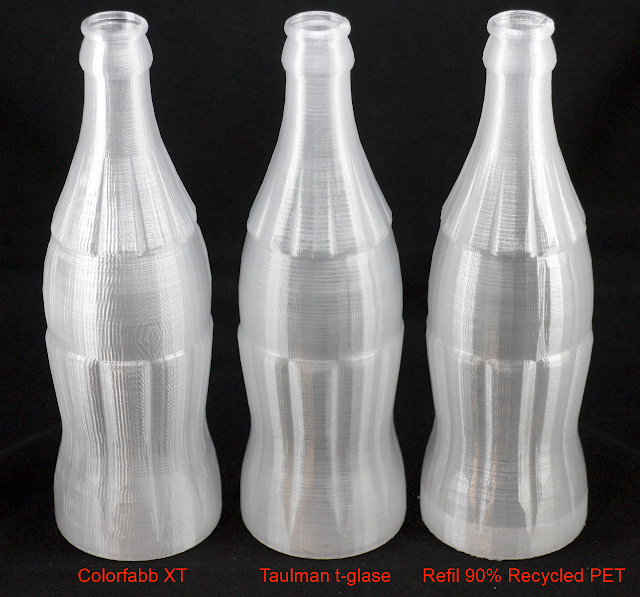 I really like PET of all types, I regularly use Taulman t-glase and ColorfabbXT. 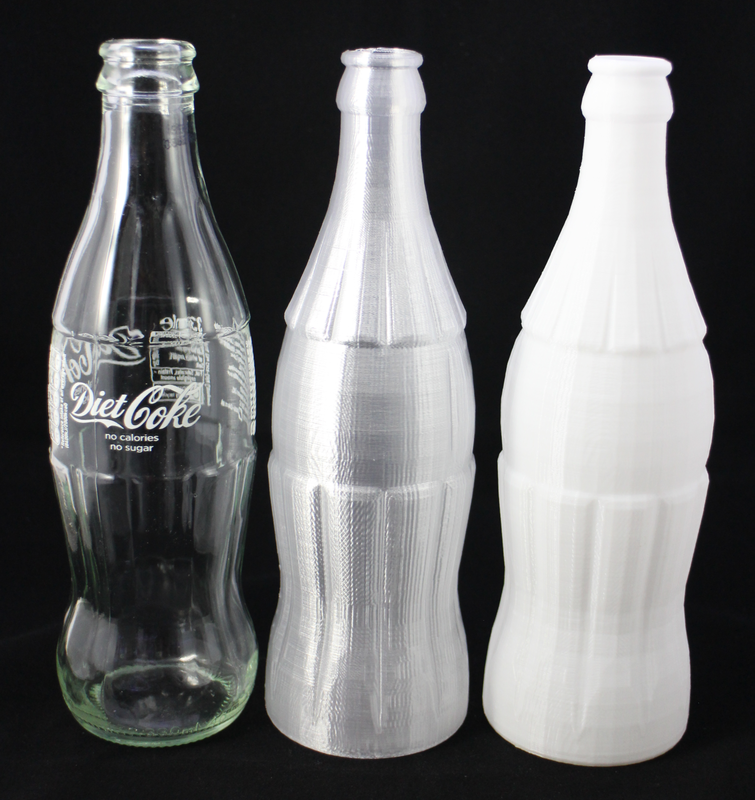 In the above image you can see the exact same print done with these different PET materials. It's interesting to note that I print ColorFabb XT materials at 235 Degrees C - the one above is at 235. Taulman t-glase is printed at 230 - Again interesting if you lower the t-glase temperature it tends to do the exact opposite of Refil and will fog with a lower temperature, t-glase has no problems at higher temperatures and you don't see the bubbling (frosting) seen on the Refil at 235 Deg C.
Whenever you get a new material (especially translucent types), it's important to test out and calibrate for the print temperature, at different print speeds and also remember to check fan cooling or when your printer automatically slows down towards the end of a print. Watch out for the effects of slow-down on a print, this can cause overheating in the material. It was really easy to check and tune Refil to a perfect 205 Degrees C - I printed everything else at that temperature without the need for any further adjustment. 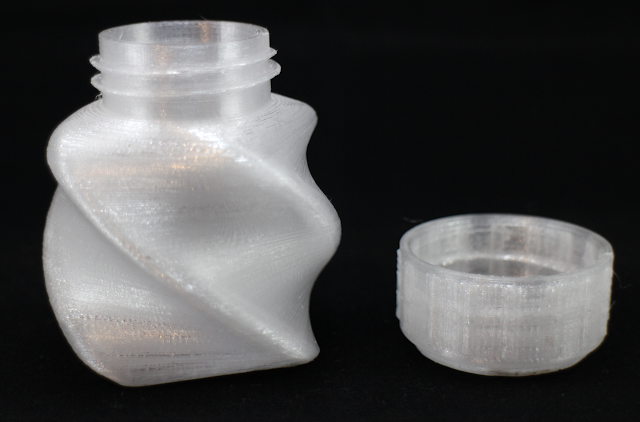 The above and all prints in this article were printed at 55mm/Sec at 0.2mm layer height, using Slic3r. When you get the correct print temperature for the speed you normally print, then print quality is exceptional. They have slightly different physical properties, but for print quality they are very similar, and light transmission (see below) is all excellent. If you compare this to PET filaments based on new materials from other suppliers, the Refil material performs like 'new'. Taulman T-glase is a PETT based formulation. 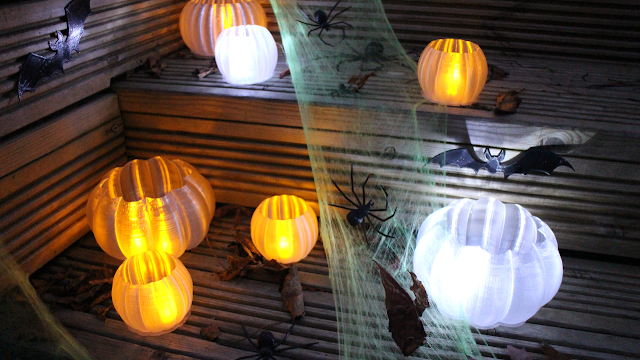 As it was the build-up to Halloween, we naturally had to print a lot of pumpkins. And we wanted some to light up the path to the house - Refil PET came in very handy. (My kids love them). 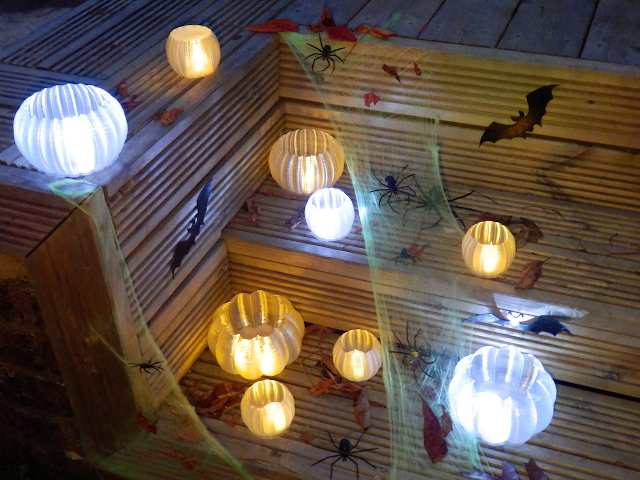 These pumpkins designed by Jeremy Gillick (get them here) are quick to print as a single walled object and look great with some LED or torch lighting. LED's and PET were made for each-other. You can print whatever you like with PET, although single walled prints do look fantastic especially with some LED lighting and they make your plastic filament go a very long way. 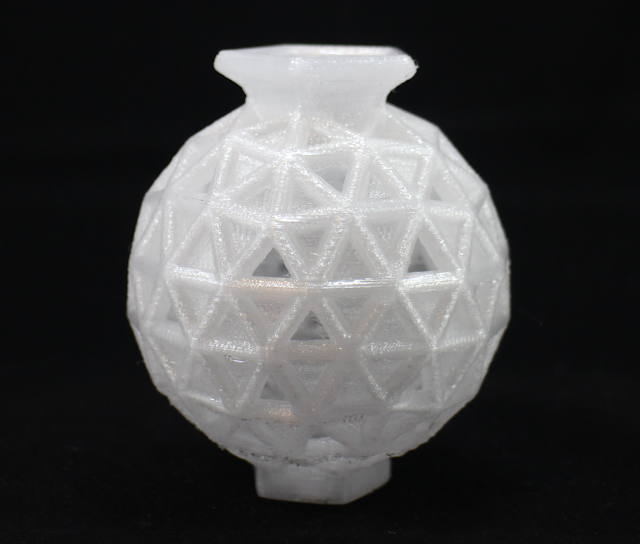 Another great model design by David Mussaffi - The Geosphere Vase 25, This is a more tricky print, especially when small, cooling is essential, but the results are very good and you can feel the strength of PET with models like this. I'll be printing even more with PET, it's starting to be the material of choice, even over PLA for some users. It will be interesting to see is the fact it's now finding a recycling route into 3D Printing will help further promote it's use. I would personally like to see more filled PET materials. Maybe we will also start to see recycled PET colours and natural fibre filled mixes available soon. You can see the Refil story in this video - Perpetual plastic. I hope that was both interesting and encouraging you to think about trying out recycled plastic? If you do, please let me know how you get on. Due to frequent requests I'm planning to do a lot more review's on 3D Printing plastic filament. If you have any specific makes or types you want me to talk about and print with, do let me know.